John Reid followed up yesterday's article for the Scum, with if anything an even more potentially inflammatory and badly thought out speech, this time in a mosque. While the interruptions he suffered from al-Ghurabaa will make the headlines, his main argument, that young Muslims are being targeted by extremists for "brainwashing" is one that just doesn't stand up to scrutiny. "There is no nice way of saying this," he said. "These fanatics are looking to groom and brainwash children, including your children, for suicide bombings. Grooming them to kill themselves in order to murder others. "Look for the telltale signs now and talk to them before their hatred grows and you risk losing them forever. In protecting our families, we are protecting our community." Reid's talk of "telltale signs" is so ripe for satire that it even sounds like a spoof article that Private Eye would print. Sadly, it's all too real. Anyway, I digress. From what we know of the 7/7 bombers, none of them had continuous contact with an imam, sheikh or otherwise that radicalised them. The alleged ringleader, Mohammed Sidique Khan, along with Shehzad Tanweer, visitied Pakistan, quite possibly to attend a madrasa. They may also have attended a training camp, where they were taught how to handle the explosives they used. No links between any of the bombers have been fully fleshed out with any radical group; allegations that they visited the Finsbury Park mosque have been played down or dismissed entirely by the security services, although whether we should believe them is open to questioning. Much more likely, and potentially more dangerous is that those who have taken part in terrorist attacks in the past have shown no outside inkling towards extremism. Sidique Khan was said to have not expressed any particular interest in politics or religion while he worked at a primary school. As Jason Burke writes in his book Al-Qaida, the true story of radical Islam, those who went and trained in the camps in Afghanistan often did so entirely of their own voilition, not because any local religious leader had told them to go. Also of note is that almost of none of the attacks attributed to al-Qaida were planned by high-ranking officials within bin Laden's organisation. In fact, those who wished to carry out bombings were encouraged to come up with their own ideas, submit them, usually to Abu Zubaydah, who was responsible for the flow of volunteers through the camps, who would consider the plans and then arrange for funds to be given if the plot was approved. 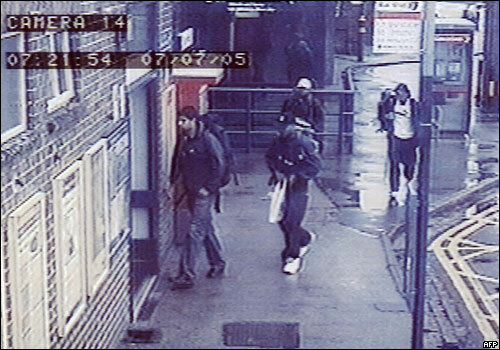 This is almost certainly what the 7/7 attackers did; while they were not entirely "clean skins" as originally claimed by the security services and police, they were undoubtedly the ones who came up with the plot, then got in contact with someone in Pakistan who helped them to carry it out, while their martyrdom videos were also filmed at the same time. Robert Pape, in his book Dying to Win, considers the war in Iraq the trigger that led to the 7/7 bombers targeting their own country, and with the wider decision by radicals that attacks in Britain were no longer off-limits. This ties in with how the security services have been accused of letting known radicals operate in Britain with impunity during the late 90s, while some of their number have been alleged to have been informants for MI5 and 6. This is the problem with Reid's whole basis for asking Muslims to be suspicious of their children or of those looking to "brainwash" them. While Richard Reid the shoe-bomber had been visiting Finsbury Park mosque, there's little to suggest that he was brainwashed by Abu Hamza. His conversion while in prison to Islam was then further influenced by his visits to the extremist mosque, but it's incredibly doubtful that he was ordered by Hamza to carry out an attack. The plan was all his own. Of those linked to terror plots, the vast majority did their own research and came up with their own ideas, only partially influenced by "mainstream" extremist ideas, such as those of Sayyid Qutb and al-Zahawiri, rather than being directly radicalised by extremist preachers or by extremist groups. Which is why Reid's pleas could potentially backfire. Rather than being concerned about them being brainwashed, parents should worry more about may happen if mainstream political activism is curtailed as result. As Osama Saeed writes, it's when moderate views, such as that of the mainstream Muslim organisations are suppressed that extremism flourishes. Past crackdowns in countries such as Egypt on relatively moderate by comparison Muslim organisations such as the Muslim Brotherhood led to the creation of groups such as Islamic Jihad. In Afghanistan, the Taliban, who although extreme were a creation of the local Islamic mysticism more than the Salafist millenarian beliefs of al-Qaida, were forced even further into the hands of bin Laden when their destruction of the opium crop was ignored by the outside world. In this country, the backlash against those who have dared to suggest that foreign policy has had a major hand in the radicalisation of some Muslim youth is continuing. Reid himself called the August letter by 4 MPs calling for a change in foreign policy a "dreadful misjudgment". Melanie Philips and her ilk condemn loudly any attempts to even talk to some Muslim groups, such as David Cameron's reaching out to the MPAC. Martin Bright, who it has to be said has his heart in the right place, is potentially doing more harm than good with his attempts to suggest that the Foreign Office shouldn't be talking or doing deals with the Muslim Brotherhood. Lord Stevens and the Sun demand that Muslims stop making "excuses" and condemn violence, whether they have been doing exactly that or not. The current situation is that we are going to have to talk to and potentially deal with organisations that hold ideas that many of us on the liberal left would consider anathema, such as the MCB's views on homosexuality and abortion. This doesn't mean appeasing such beliefs, it doesn't mean agreeing with them or even accepting their arguments, but it does mean that we are going to have to listen and not just pretend to be doing so either. It's only through doing this that we will help tackle extremism; not telling communities what to do, not frightening them into watching their kids at every moment or stopping them from taking part in politics, but through listening and properly consulting. Effective policies and learning from what we know should be the order of the day, rather than playing to prejudices and relying on short term political gain.